Weaver Tree Farms is nestled in the heart of the southern Appalachian Mountains in West Jefferson, North Carolina, right on the Virginia and Tennessee borders and less than 30 minutes from Boone, NC. 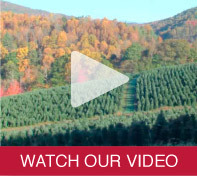 Weaver Tree Farms, Inc. is a member of the North Carolina, Virginia, and National Christmas Tree Associations, as well as the American Nursery & Landscape Association and the Ashe and Chattanooga Chamber of Commerce. We specialize in Fraser Fir Christmas Trees, the “Cadillac” of Christmas trees, but also provide customers with a full range of other evergreens, including Eastern White Pine, Colorado Blue Spruce, Canaan Fir and Concolor Fir. 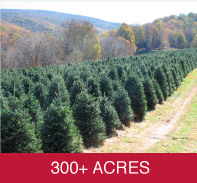 The Fraser Fir grows naturally in the southern Appalachians, at elevations above 3,000 feet. The combination of form, needle retention, dark blue-green color, pleasant scent and excellent shipping characteristics has led to Fraser Fir being a most popular Christmas tree species. With over 40 years of experience in growing Christmas trees, and over 300 acres of planted trees in production, we can easily accommodate the needs of today’s consumers. We pride ourselves in fresh, top quality trees, customer service and satisfaction. Our focus on trees and service consists of appearance, proper shape, freshness, disease free, proper storage, handling, timely shipping, and delivery. As a family operated farm, we are able to provide our customers with personalized attention to meet their individual needs.